A couple year's ago I had an email from Charlene who has a greyhound named Hailey about the Porter's Lake Provincial Park and how fabulous a place it was to go after all the damage of hurricane Juan, and I'd never gotten a chance to go there. Boy was I missing a great place to go! It is heaven for dogs. There's tons of trails and things to smell and pee on and the place is absolutely huge! There's a great website on the provincial government's site that gives great directions on how to get there and also what amenities it has - it has camping facilities and stuff if that's what you're into - but it's also got great big chunks that are pretty deserted - which are the part me and the dogs went to. 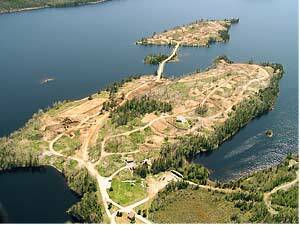 The provincial government's page is at http://www.novascotiaparks.ca/parks/porters.asp -to the right is an aerial picture from that website of the park. I can tell you that from the ground the park doesn't look anything like this! The way I got to the park was by heading out on the Cole Harbour Road (which is in Dartmouth of course!) past Lawrencetown beach and then turning left at a sign that said "provincial park" - which is just a couple kms past the Lawrencetown beach - and you drive for several kms on a windy road until you come to the Porter's Lake Provincial Park - which is on the right hand side of the road. And bring your bug spray! Daisy finishing up peeing on something very good, and Charlie deciding whether or not he was going to take his turn peeing on whatever Daisy had just peed on! To the right is Dinah looking off in the distance - she's pretty sure there's a squirrel somewhere just laughing at her - and she's going to find it and make him pay!